We can accept most file types, however, we prefer to receive jobs as pdfs. If you have created something in InDesign or QuarkXpress, please ensure that it is ‘collected for output' so that all images and fonts are included in the file. We do not proof read any jobs that are sent to us 'print ready'. We endevour to point out any spelling errors, and check for anything that doesn’t quite look right as far as layout or imaging is concerned so that you can put it right before we print your job. We require all artwork that contains images or areas of colour to include an area that allows for trimming after we print your files. We recommend that all pictures or solid areas should extend 3mm beyond the edge of the artwork. 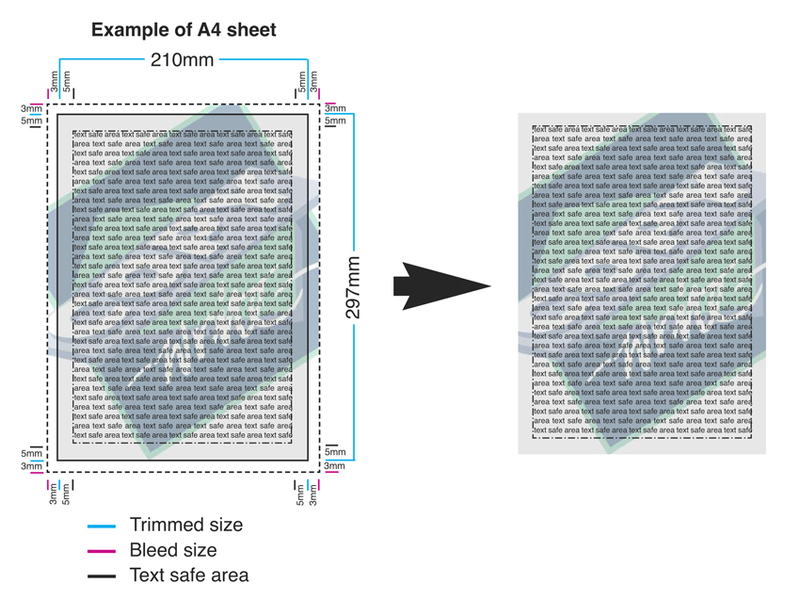 A 'safe area' of 5mm around the edge should also be included in your finished page size for text or images not included in the bleed. This will avoid text or pictures being cut off. Bleed areas can be set in design software such as Publisher, Adobe Indesign, Quark Xpress and Illustrator, in the document setup but do remember to include this bleed area when you are saving your pdf file! We print on SRA sized paper, so the most economical way to set your artwork is to stick to the 'A' range of sizes (A6, A5, A4, A3). If you do have an out-of-the-ordinary size you want printing - give us a call, we will always do our best to accommodate you! Font issues are common, especially when using PC files, this is why we ask you to create a pdf from the computer you created the file on. This will ensure that what you see on your computer is what you get on your final job.If creating jobs in Illustrator, you will need to convert text to outlines. This makes our computers see your font as an image, and therefore we don’t need the fonts you have in your job on our computers. 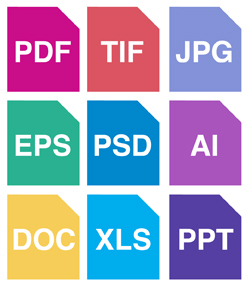 Files should ideally reach us at a minimum of 300 dpi. This will ensure that we can produce the finest quality imaging we can. However - this all depends on the quality of the image you have used in your artwork. Images pulled from the internet are optimised for screen at 72 dpi - not for printing - so even if you up-sample the image to 300dpi in an imaging package, it will not look any crisper. Taking images from the internet can also have legal consequences, as many are under copyright - check before you use them!